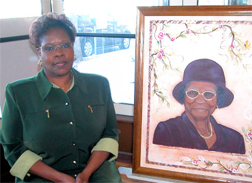 Gale Stephens, a talented artist, was born and raised in Toledo, Ohio. She graduated from Scott High School and just recently retired from Toledo Hospital, after thirty three (33) years of service. Gale's interest in art developed after taking a basic course in high school. Her instructor was the well known artist and teacher, Mr. Ernie Jones. Mr. Jones is well known in the Toledo area for his many art works and successful line of students. From this experience she begin to refine her talents and to enter art and craft shows throughout the area. This continued during her employment at the hospital where she won numerous awards for her projects. that sold very well for her. In addition to her many accomplishments, Gale was recently chosen as a potential candidate to represent the professional and business community of Toledo, Ohio in the Biltmore 2009 Honors Edition of Who's Who among Executives and Professional. Once finalized, gale's listing will share prominent space in the Biltmore Registry with thousands of fellow achievers across the nation, each representing individual accomplishment within their own geographical area. Gale's goal is to exhibit in different galleries in the Toledo area and eventually travel to Dallas, Texas. She would love to work again with Sheila Mosley, former Toledo photographer and close friend. Gale is currently working on art of President Obama and wishes to paint scenery around the country. Her favorite media is acrylics but also works with oils, wood, and canvas. Married for (29) years, Gale is the mother of two and the grandmother of two. She can be contacted at 419-376-0602, web: bfc-seeds.com, email: gale@bfc-seeds.com. She has three beautiful paintings on view at the Truth Art Gallery, 1811 Adams, Toledo , 419-243-0007.